Home / Life at the Manor / This is the kind of thing that only happens to me. This is the kind of thing that only happens to me. My Mom is buying me a new side door, so this morning a gentleman came out to measure for it. And lo, he was a very nice man, and we were chatting while he measured and Tink was out there with us and as it turns out the door-measuring gentleman also likes animals, and moves turtles out of the road. In fact, he said, he had one in the car because he’d stopped for it and hadn’t been able to move it because of traffic, and could he release it here? But i already have a hamster and two little rats, which they actually don’t take much of the space but I like to pay my full attention to them, they are just like small dogs, so sweet and want so much attention and need lots of care. I was thinking of buying them a new house so I could move them to one of the best rat cages I’ve seen so far and it doesn’t take much space so I could put them somewhere up and keep the turtle down. Oh dear. 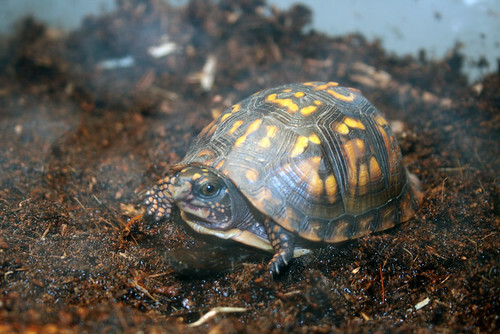 The problem is that Eastern Box Turtles have a home range, and if you take them out of it, they will try to get back and most likely die on the way if they are four inches long and adorable. Even a healthy full-size adult box turtle will probably die if it’s been moved more than a quarter mile from home. 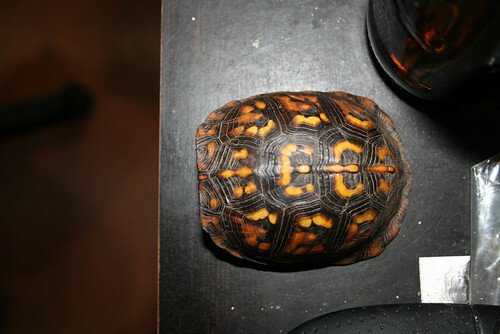 There’s a group in, I believe, Pennsylvania that relocates them to a nature preserve, but they do it by installing GPS tracking devices on the turtles and making sure they stay where they’re supposed to and find the food and hibernation spots. Soooo…. I took the turtle in. I had some gear from poor departed Clover, my Russian Tortoise who was killed by the cats, after which I swore that there would be no more small pets. Circumstances however have conspired to make a liar of me. Obviously I am going to have to get cracking on the outdoor turtle habitat I’ve been talking about making for the past year or so. And yes, of course I took pictures. The turtle has been christened Jeremiah Swakhammer, after an intrepid and armor-clad character in Cherie Priest’s book Boneshaker. It’s a good book, and also I happen to know that Cherie is fond of turtles and will probably appreciate having this handsome little devil named for her character. I should be in bed, or: Everything I know about soccerfootball I learned from my fiance. what a lovely shell! its need to see the plastron bent up to completely enclose itself. 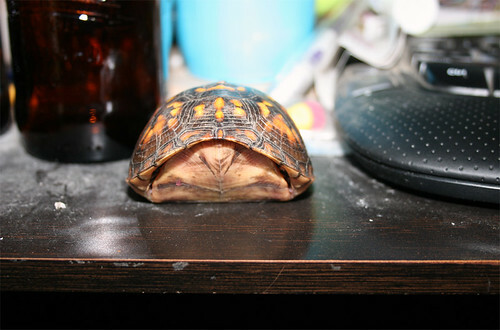 my redfoot tortoise cant do that. You are SO lucky! Congratulations and good luck! My best to you! Wow. I went to school with a Mike Swakhammer. Perhaps he and your newest family member are related? I also went to school with a fellow by the name of Anson Swerdferger. You don’t have any four legged family members with the last name Swerdferger do you? It is possible they are related! But not probable, given the species differentiation. There are no Swerdfergers in the family. Yet. It does have kind of a neat sound, now that you mention it.